Part of successful employment for anyone is a welcoming and inclusive workplace. Workplace etiquette is the key to ensuring that everyone in the office is comfortable and able to thrive in their careers. There are many tips for workplace etiquette that can be found online, but I wanted to talk more personally about how to truly respect a colleague with a disability, beyond saying the right thing at the right time. I asked my colleagues at Starkloff Disability Institute what they feel matters most in an inclusive workplace. Disclosing a disability is a challenge for many people in the workplace. Once someone has the confidence to disclose to you, don’t abuse that privilege by overstepping your boundaries. For example, you wouldn’t pry into the personal health matters of your able-bodied co-workers or make inappropriate jokes about things beyond their control. The best solution to this tip is to keep it professional, like you would anyone else. Many people with disabilities are bombarded with questions like, “Do you need help with that? Are you sure you can handle that? Is there anything else I can do for you?” While help is always appreciated, respect a person’s ability to do things for themselves should they choose to refuse help. Your colleague is much more capable of navigating their disability than you could imagine. With that in mind, don’t be afraid to ask those questions. Your colleague with a disability may not need help this time, but they will identify you as a source of support that they can call on at a later date. 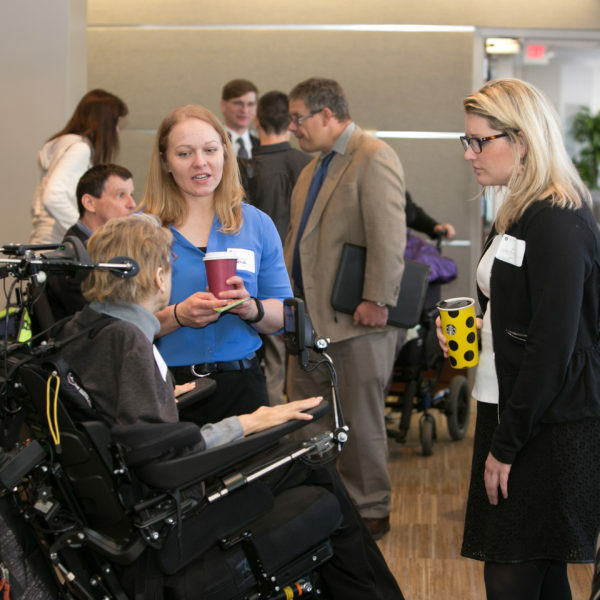 Accommodating your colleagues with disabilities spans beyond work tasks. Something as simple as using the bathroom is a lengthy and precise procedure for someone with limited mobility. Often times, my disabled colleagues work through lunch because of the amount of time it takes for them to eat. Do your best to not make comments regarding the length of time it takes for personal tasks. People with disabilities are aware, and sometimes self-conscious, about how long it takes them to do things that take able-bodied people a fraction of the time to do. While work interruptions can be handled with your HR department, know that they are doing their best to live a quality life while also enjoying the advantages of employment. I hope these pointers from my colleagues can help you to create a more inclusive, welcoming work environment for your colleagues with disabilities. It’s important to keep in mind that every person with a disability is different, and these tips are not one-size-fits-all. However, if you incorporated just one of these into your daily habits, you’d be creating a much more inclusive workplace for all. We believe people with disabilities in the workplace make it a better place. Do you?